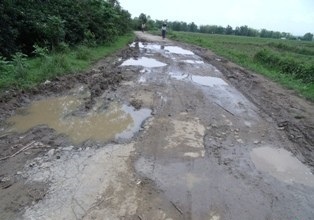 Strong resentment is brewing among the residents of Kalaigaon area in Udalguri district of Assam following the alleged poor quality repairing work of Mangaldai-Bhutiachang State Highway-4 road. The deplorable condition of the road has given a nightmarish experience to the commuters. The locals alleged that unholy nexus of PWD officials with Prabhu Agarwalla Construction Private Limited has led to the sub-standard quality largely, resulting in poor construction of roads. In a recent incident, aggrieved locals along with activists of Kalaigaon AASU and AJYCP strongly voiced their resent against the poor quality work and demanded blacklisting of the company. The newly carpeted roads in the Bholabari, Garubandha area have already started deteriorating. A resident of the area showed the damaged portion of the road in front of his house, which he said, was constructed last year. “If such is the level of development, then we don’t need it,” he said. “It is a sheer wastage of public money,” he added while fearing the road could get further damaged with season’s first rain if not repaired immediately. A stretch of 19 km road of Mangaldai-Bhutiachang road was alloted to the aforesaid company at an estimate of around Rs 29 crores in 2011 which was completed in 2013. The company was alloted additional fund of Rs two crores for repairing from Borkhola to Bhutiachang in 2016-17 following which the roads were carpeted. The students’ bodies have demanded high level inquiry into the matter.